January 18, 2016 by Nancy Burns, L.Ac. Many of my patients have retired in El Dorado Hills and are enjoying the active life. Part of that active life may include tennis, golf, or even new exercise regimes. With that get up an go comes the possibility of injuries like Tennis Elbow or another repetitive stress injury. It can be painful and more importantly disruptive to one’s established plan for well-being. I have noticed a trend with clients who enjoy tennis as both a social and competitive sport – they are looking for an alternative to surgery when injuries happen. Many are now turning to acupuncture for the solution to repetitive stress issues. They know that by doing nothing they risk having to give up the sport entirely – and surgery has its own inherent risks. I provide a happy medium. Fortunately, acupuncture is very successful in treating tennis elbow in as few as three treatments. So there is no need to consider surgery as your first option! I have a patient who plays on a tennis team at a sports club El Dorado Hills. She is a competitive person always looking for improvement in her game. She tried a new racquet with a larger head. That was enough to change her swing ever so slightly, not even noticeably to her. Enough however, to cause a new repetitive stress on her elbow to the point she had to stop playing. The pain did not go away with rest and her frustration increased. She came to see me as a referral from a patient of mine who plays on her team. After the first treatment she noticed improvement, and was thrilled. The pain was reduced to a manageable level. 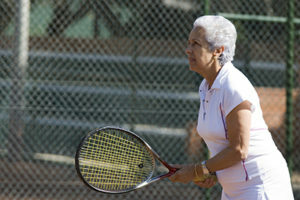 After 3 more treatments, total of four, she was able to resume tennis. She started slowly, allowing her body to heal and readjust. Within a short time she was back in the swing of things. She comes to see me periodically for what we call a “tune up” and her former problem is non-existent. Acupuncture reduces pain, inflammation and helps to accelerate the healing process. I treat the whole patient so what seems to be an unrelated health issue may actually be a contributing factor. In addition to dealing with the repetitive stress injury I also work with the patient concerning sleep quality, stress level, exercise, life style, diet and nutrition. Acupuncture is a relaxing experience, aids in relieving pain and stress it has the ability to improve many other health issues. My patients notice improved digestion, better quality of sleep and feel more energized, even lower blood pressure. Repetitive stress injury is a form of tendinitis which causes pain and inflammation of the forearm. Golf, weight lifting, even knitting can cause this injury. I took up knitting at one point and after a week I could barely use my right arm! My muscles were not accustomed to repeating a movement over and over for a prolonged period. I became my own patient. Here’s the thing – pain and inflammation will only get worse until it is treated. It is best to save yourself the added stress and strain to heal properly and completely. We can do it together. I promise it will be faster with acupuncture than going it alone.